Independent Investment Research - Berkery, Noyes & Co., LLC. Our overall hypothesis at Berkery Noyes is that the independent investment research marketplace is finding its way amidst the previous market turmoil, recent and unwarranted issuer retaliations, the end of the Global Settlement monies and the declining number of investment management professionals. Independent investment research has a market size estimated at about $2 billion and growing, and represents approximately 250 companies in the United States. Yet we have been noticing a consolidation in the marketplace: companies between $8- $20 million in revenue have faced serious challenges achieving their next level of growth. The decrease in the number of traders and fund managers, coupled with the decrease in discretionary spend of retail investors seeking alpha, may have temporarily thwarted the upward momentum of both leading and average firms. Although the end of the Global Settlement has not impacted many of the research firms, it has created a hole for some of the larger providers. To offset some of these challenges, investment research firms are looking to become multi-faceted by enlisting qualitative, quantitative, and expert network services, integrated within multi-asset class offerings. This is a direct attempt to increase competition with the larger research providers, such as Morningstar, S&P, MSCI, Risk Metrics, Moody’s, Thomson Reuters, IHS and Gerson Lehman. In addition, we have noticed some firms are taking advantage of the recent challenges facing the credit rating agencies by entering this marketplace, albeit cautiously. Lastly, we have noticed that some firms have realized that a larger balance sheet can help sustain them in a down market and when dealing with adverse situations, such as “issuer retaliation” a common concern throughout most of the investment research marketplace. It is our opinion that with the recent credit rating agency concerns, the recent sell-side research issues, and the conflicted activities of independent auditors that over the next few years, independence within the marketplace will return to prominence. However, despite our bullishness on the industry, in the near term we see continued consolidation with companies seeking greater sales and distribution systems, larger balance sheets, and diversified offerings leading the way. Companies that are at the apex of the growth curve, those that are at the crossroads of raising more capital for infrastructure and hiring a larger sales force will be most favorable for an exit by a larger strategic provider. 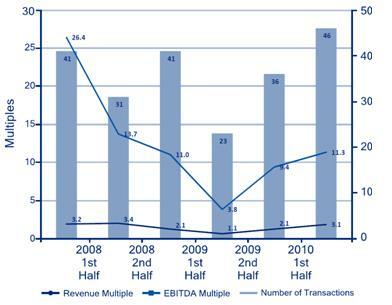 Compared to the second half of 2009, the first half of 2010 has shown 40% and 20% increases in Price to Revenue and Price to EBITDA multiples, respectively. We believe these attractive movements in multiples will only accelerate consolidation in this industry. The strategic acquirers that have been active in this marketplace are those you might expect, such as Morningstar and MSCI Barra but media conglomerates have also been expressing interest in this market. We have seen some of these firms purchasing their way into the investment research business. It is not far-fetched to see social media companies such as LinkedIn purchase Expert Network Providers and or dabble with equity and or fixed income research. For example, SourceMedia has recently entered the independent investment research business with the hiring of Jim Moore, former CEO of Highline Financial. The continued interest on behalf of media companies to diversify their portfolios into research will most likely gain traction as such businesses are not associated with ad revenues or steep correlations with marketing spending. In addition to media companies, market data providers and analytics companies without news organizations also find great value in independent investment research providers. Most recently, FactSet’s acquisition of MarketMetrics, Thomson Reuters acquisition of Asset 4, and Point Carbon and Morningstar’s acquisitions of Old Broad Street, Aegis Equities Research and Realpoint LLC support this point. Other financial information providers, such as MSCI Barra, will continue to find interest in data analytics and quantitative research firms, as evidenced by their recent purchase of Risk Metrics. Overall, we are bullish on the independent investment research marketplace long term, yet cautious over the next few years. Only time will tell, but it seems that with the consolidation in the industry, the higher quality independent investment research providers with deep domain knowledge, strong intellectual property, and strong margins will be acquired and those with less than stellar margins and limited access to sales distribution may find it challenging to compete.